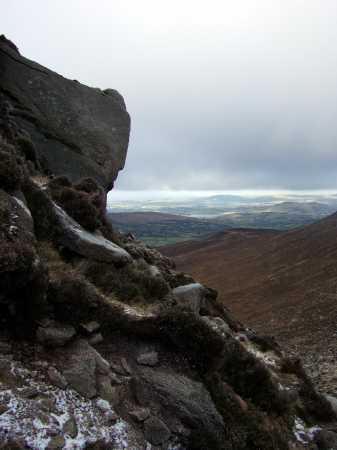 Dandering home from the Mournes; and Elyne Pyge on BBC Radio, had Brian May choosing his favourite songs from stage and screen. The cynical anticipated either something awful from Blue Hawaii or demented from behind Bowie’s filing cabinet. As it was, we got “Maria” from Bernstein, Doris Day “Secret Love” and Gordon MacRae “If I loved you”. Reference the last, May highlights the diminished chord that takes us into the subjunctive that is IF. Now this is the kind of thing that drives the progrockers berserk about Brian May. Subjunctives too complicated, Doris too simple; and that of course is what endears him to the rest of us. Today, after a ski-ing expedition sans skis, a multi-bruised arse and a bad temperament, I was bargaining my way through the bagatelle board that is the high Trassey Track, when below me the hunter’s eyes and broad smile of a man enraptured by the hills – thin as a pipe cleaner with skin the colour and consistency of old boots and the handshake of a believer. He is Darryl Grimason and for those lucky enough to take their TV from Black Mountain, they will know him as the presenter of wonderful water, bog and heather-bashing works like “Off the Beaten Track” where he shepherds us into the magical Mournes and wet Cuilcagh. Amongst the self-appointed elite of the high hills, there would be those who grumble at his subjects and style. They grumble because DG unmasks these cutpurses who would claim the hills for themselves - and instead, he gives them to you, me and the man down the road. Today, the ingenus he was leading on to the Gap may be tomorrow’s elite - with a whole different take on the hills – and themselves. And boy does that endear him to me!